Based upon linear static loads and restraints, the topology study will ‘remove’ elements from the finite element mesh until the target mass or best stiffness-to-weight ratio shape is reached. This iterative process of element removal is limited by the study constraints such as maximum allowable deflection and any manufacturing controls. Let’s dig into this new study by considering a simple example that I carried out recently. The model, shown below, is a simple gas assisted hinge lift mechanism, and the task is to refine the design of the blue component to reduce its mass while maintaining its stiffness. The first step of the design refinement process is to determine the loads the link will experience during the hinge operation. The current release of the topology study can only be applied to parts containing a single body, but the loads experienced by the link are due to the assembly motion. 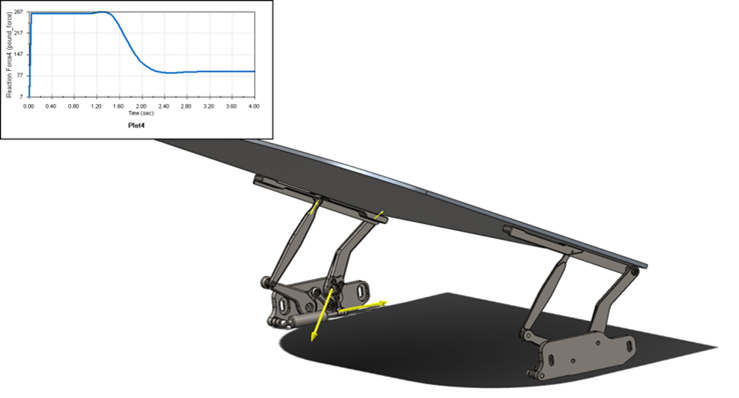 By carrying out a motion analysis on the assembly, the loads at the link connection points can be calculated and transferred to the part for analysis. The loads on the blue link are shown by the size of the yellow arrows in the image below and the maximum load on the gas strut. It is good practice to run a static study on your part prior to running a topology study to make sure that the loads applied do not result in a solution that violates the linear static assumptions of small deflections and stresses that are below the components’ yield strength. Creating a Topology Study is no different than a static study; the materials, loads and restraints are the same. What is different are two new inputs: Goals and Constraints and Manufacturing Controls. 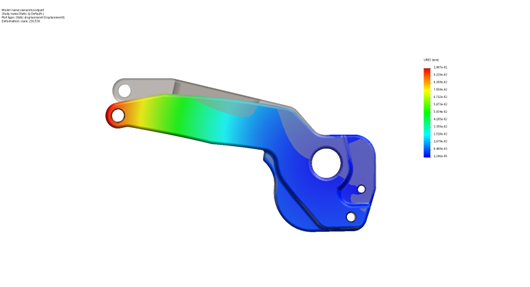 SOLIDWORKS Simulation 2018 introduces a new study type, the Topology Study, which enables designers and engineers to develop innovative minimum mass components.The goal of the topology study can either be to minimize the mass or displacement of your part, or to maximize its stiffness (best stiffness-to-weight ratio). It’s a good practice to start with the best stiffness-to-weight ratio (Maximize stiffness) option. 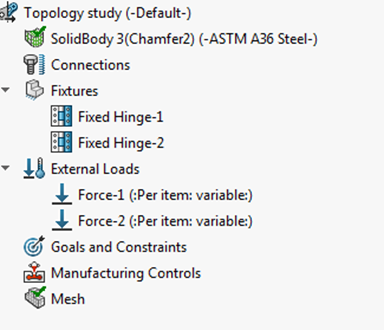 In a case where you will have a maximum displacement of the component that you do not want to exceed during the topology study, use the goal to minimize maximum displacement or minimize mass with a displacement constraint option. You will notice that all three goals always minimize mass. The effect of altering the target weight reduction is shown in the images below. The last step in the study setup is to add any manufacturing controls. This is an optional step and it is not required for the study to run but it enables you to have both control over the resultant shape and also consider the downstream manufacturing methods. Manufacturing controls are Preserved Regions, enabling you to exclude areas of the model from the topology process, Thickness Control, to set minimum feature thicknesses, as well as Model Symmetry and defining a De-Mold Pull Direction, which is a casting constraint. 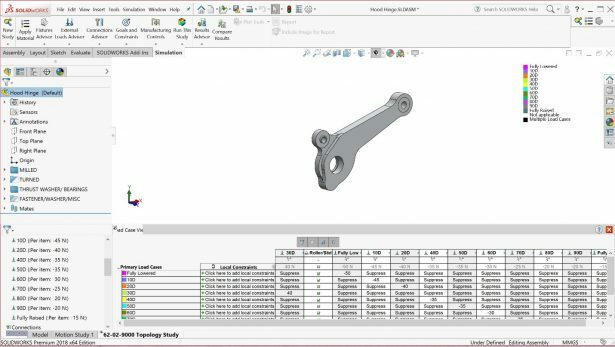 SOLIDWORKS Simulation includes a Load Case Manager, which is ideal for this simulation because you can determine the minimum mass component that meets all of the loads throughout the hinge operation. Once you have your topology results, what do you do with them? For those with access to a 3D printer, the result from a topology study can be exported as a smoothened mesh. This mesh can be sent directly to a 3D printer for manufacturing, but further validation of your component based upon the printer’s materials is essential. But that is not to say that the topology study has no use for traditional manufacturing processes. The results from a topology study can be overlaid onto the original geometry and used as a guide to create cutouts and pockets for traditional CAM solutions. Topology, 3D printing and other emerging solutions are changing our expectations of product design. With the release of SOLIDWORKS 2018 our customers are enabled to take advantage of these new manufacturing technologies and processes to deliver innovative products to market. 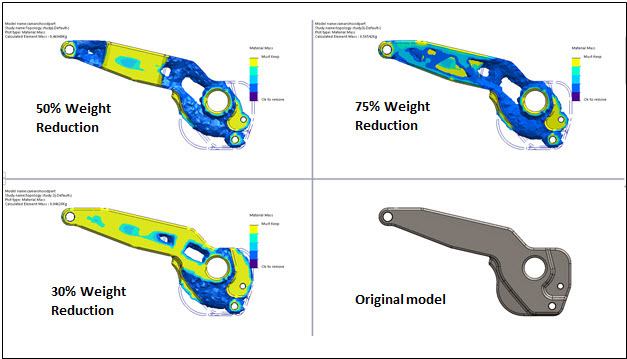 Using the topology study in conjunction with Additive Manufacturing enables companies to redesign an existing part to reduce weight and improve the performance (best strength-to-weight ratio) of the parts as well as reduce the number of parts by combining many connected parts into a single part. 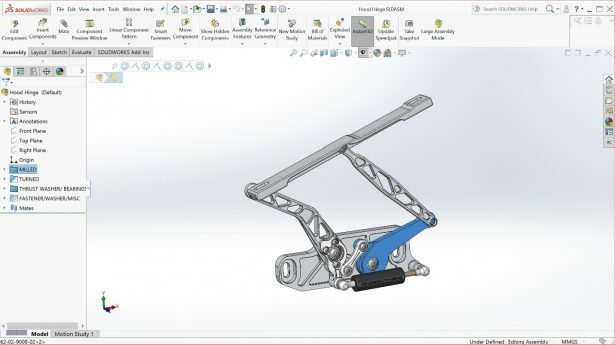 This post was originally published By Hari Padmanbhan on the SOLIDWORKS Blog and is being reposted here with permission from Dassault Systemes SolidWorks Corporation.